Once again a picture from India inspired me. 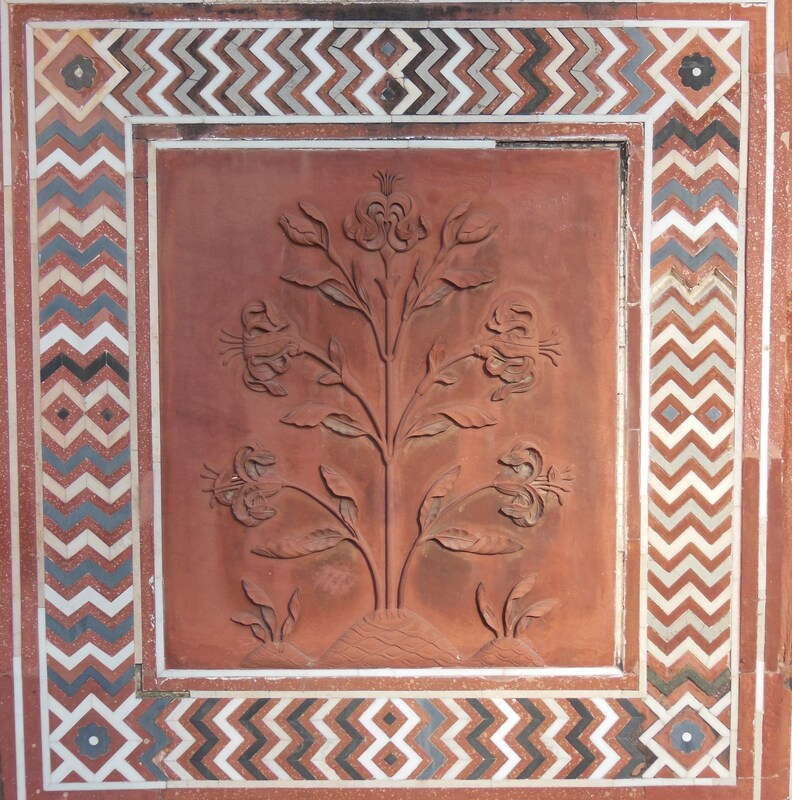 Taken at the Red Fort in Agra, this is a detail from a bas relief. I did not want to copy it, so I kept the main idea and took some artistic licence with the composition. This is the first piece of a series, I don’t know yet if the series will have 3 or more pieces. I have decided to concentrate on backgrounds and technique. 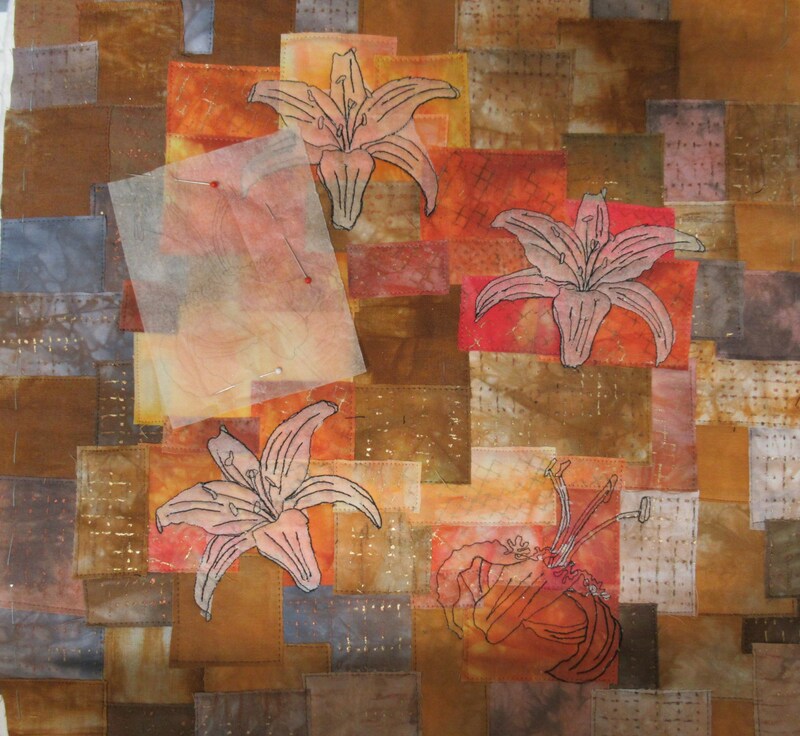 I made a rubbing on the background fabrics with markal paintsticks and a grid underneath, cut them into squares and rectangles, then layered them randomly and fused them. I secured each square with transparent monofilament, and waxed them to prevent fraying too much. 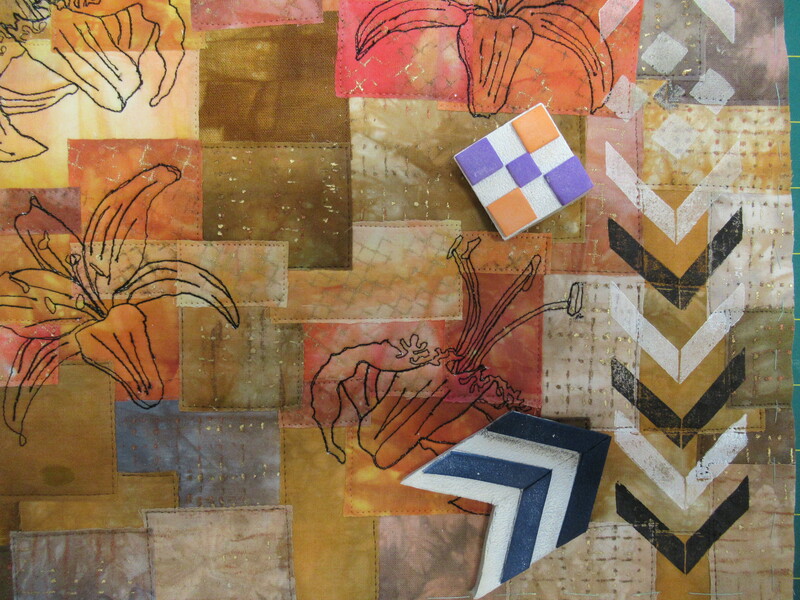 Edges : I kept the idea of a mosaïc border on two sides only and simplified the design. I made a stamp to print it. The flowers come from a copyright free book I have, I played with their size for the composition. I prepared my designs on tracing paper and free motion stitched them with black thread. The quilt is faced. Your love for India come out. I love the background, the composition and how you have realised the mosaic, Bravo! Your flowers are dancing in the hot weave! It is so nice how you used the different techniques. 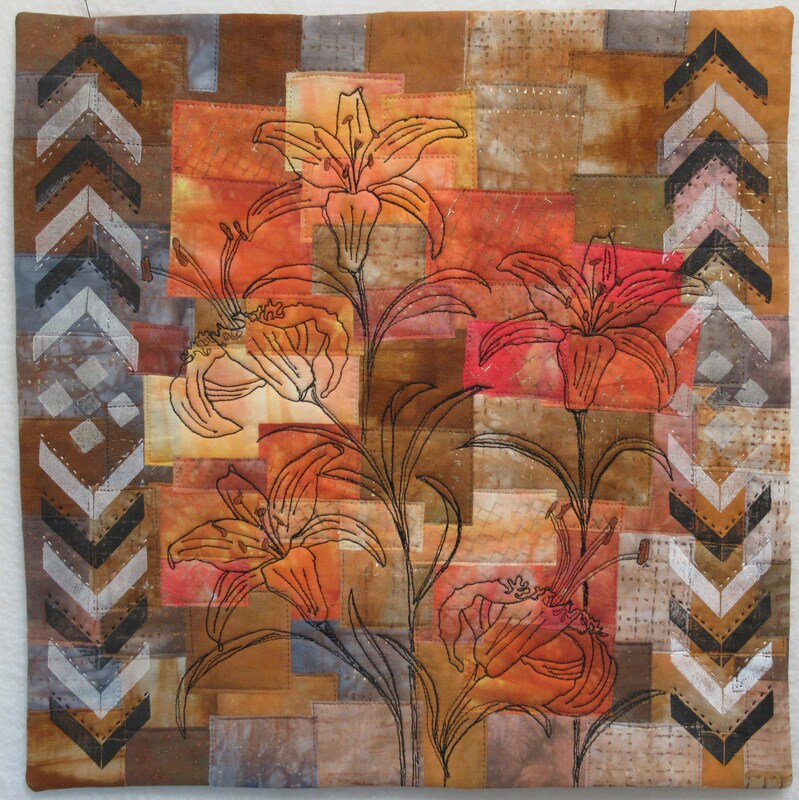 Stamping the mosaic borders shows your creativity. I love the way that you have stylized your picture into such a lovely design, whilst still keeping the main elements of the original. As always, I admire your free-motion stitching, and I find the techniques you have used to create the background very interesting. A lovely piece. Lovely piece reflecting the colours and forms found at Agra. Great! India is such a wonderful source of inspiration. I love how you have created this piece, especially the background. Lovely, gentle work. I would know it is yours no matter where I saw it! The free motion stitching is great! All in all a very beautiful piece. A really interesting piece Chantal. I love the different techniques you used, especially the stamping of the borders. You managed to bring the warmth and sun of India in it, well done! I immediately recognized it as your work. The India motief, the beautiful choice of earth tones and orange, it all is so elegant. Your stitched flowers stand out wonderful and the stamped border is a very creative idea. Well done.